A good fringe festival always encourages the difficult, the ambiguous and the very odd. For audiences, there should be the potential for every kind of confusion, from the merely frustrating to the darkly sublime. 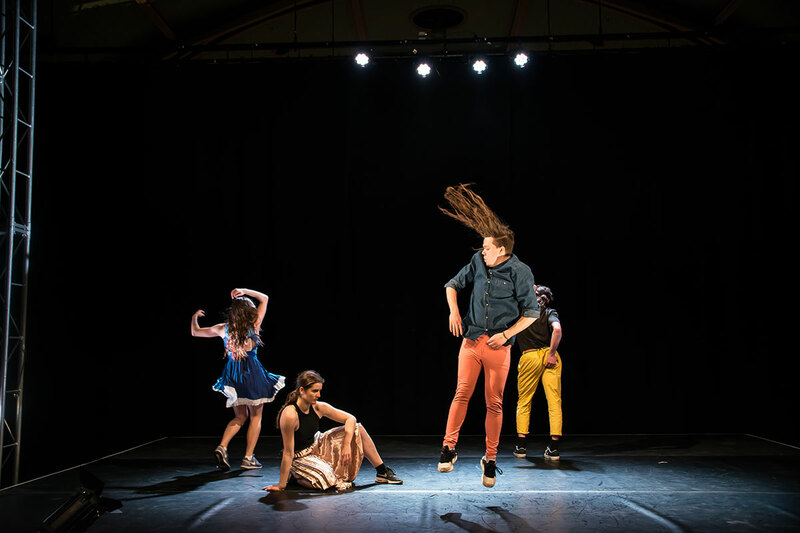 By this measure, the dance program of the 2016 Melbourne Fringe Festival was certainly a good one: often provoking and amusing but just as often baffling. Nebahat Erpolat’s Emptying the Bucket is nothing if not enigmatic. It has the density and seriousness and mystery of a Zen koan. And, indeed, it could be that the title of the piece is a lateral reference to the 13th century Zen abbess Mugai Nyodai, who is said to have achieved enlightenment when the bottom fell out of an old bamboo bucket she was carrying. In any case, this is a work which inspires doubt. Erpolat describes Emptying the Bucket as a meditation on love, and yet it’s shot through with images and rhythms suggesting disconnection and loneliness. The four dancers seem to move in different spheres, and it is only with the greatest effort that they are able to force a connection. Harrison Ritchie-Jones, in skinny jeans and t-shirt, jives and bops as if listening to his own private mix tape. Josh Twee watches and broods and moves in sudden jerks and leaps. Eventually, he throws himself at Ritchie-Jones, pushing him to the ground, clinging to his legs in a paroxysm of desire. Ritchie-Jones barely seems to notice. Emma Riches, improbably costumed as a cheerleader without the pompoms, performs lyrical fragments in isolation, only fleetingly joined in awkward duets. At one point, Ritchie-Jones holds Riches horizontally across his chest, using her leg like an implement to point at and push Twee. Meanwhile, Sheridan Gerrard looks on mournfully; at intervals, she leaves the stage and jogs around the theatre space, including the audience within the rune-like scheme of the performance. The stage itself is bare, austerely lit in blue. The exposed stage rig looms like a skeleton in a museum. Moments of extreme stillness give way to heavy stamping and screaming. All the performers search for a new formula for the pas de deux of love, but it remains elusive. The piece won the Fringe Award for Best Dance, and it’s clearly a work of great complexity and depth, with multiple layers and intersecting patterns. There is confusion in the restless shuffling of bodies and the energetic surges, and there’s plenty of theatricality, but there is also the rigorism of a choreographer who wants every shape to be just so. Another standout on the Fringe dance program was HardQueer DeathPony (You’ve Had Worse Things In Your Mouth), choreographed by Chad McLachlan. This work, too, is profoundly enigmatic, but in a more surreal and teasing way. It’s a short piece, and the action is easy enough to describe. On entering the space, audience members are offered a slice of extra sugary chocolate cake. Once everyone is settled, the two performers—McLachlan and Matthew Hyde—don rubberised pony masks and, with a great air of ceremony, pour litres of cream over each other. As they pour, they entwine their limbs in an exaggerated but genuinely tender embrace. The cream, obviously, ends up everywhere. As if to confirm their union, the two are then bound together with clingwrap. After freeing themselves from this tangle, there’s a brief envoi involving small piles of potting mix, the details of which are very difficult to make out amid all the shadows. Finally, McLachlan and Hyde tidy the space and exit abruptly, leaving the bewildered audience to guess at whether or not the show is really over. Despite the queer eccentricity of the work and its sexualised overtones, HardQueer DeathPony has a meditative, almost devotional quality. There is something quite solemn about it. The two figures are lit throughout by a wash of bluish purple from an LED projector, and the key to the work’s unexpected fascination seems to be the well-defined shadows this creates on the wall. The way the dancers come together in silhouette and the way their forms are flattened and transfigured is utterly absorbing. The silliness becomes something almost mythical in the shadow play: black forms cut out against the lurid colour. The tension between the graceful clean lines of the shadows and the sticky mess in front of us on the plastic tarpaulin resonates on multiple levels, including the spiritual. There are many memorable visuals in this enthralling show. You could try to puzzle out their literal meanings, but I suspect it all works best as pure fantasy: as the movement from a dream world toward something even more abstract and ancient. Finally, Zac Jones’ The Right Unravelling explores the idea of contrasting rhythms and tempos inhabiting the one body. It’s a partly improvised performance with a highly distinctive movement vocabulary, one which shows off the influence of Jones’ Aikido training. At its best, the work resembles a choreography of spasms, tracing different levels of intensity across the body. It’s a line of movement research which produces some striking images, particularly in the earlier parts of the work. This is what I imagine one of those partially blurred Francis Bacon portraits would look like if danced: a man madly whirling his right arm in circles while the left arm slowly noodles about. At times martial arts training is directly referenced. The middle section, for instance, where Jones slaps and buffets himself, appears to be based on an Aikido warm-up exercise used to stimulate the muscles. At other times, it’s visible only in his focus on proper conscious breathing and in the way he sets himself and thrusts out his elbows. The Right Unravelling also features live accompaniment from Melbourne sound artist Ziggy Zeitgeist, who creates a kind of aural bricolage of found sounds using a sampler. Dancer and musician are not always in harmony, with each at times pursuing different ideas; yet even this friction seems appropriate to the project. Conceptually, the Right Unravelling is a more straightforward proposition than much of what was on offer at the Melbourne Fringe. And yet there is something undeniably strange about the way Zac Jones moves. He looks something like a spinning top which is starting to lose its spin. He remains centred, and his legs remain relatively still, but his arms and the upper part of his body describe graceful and ever widening circles. It’s mesmerising, but also faintly disturbing. It’s worth noting that Zac Jones was, in the early 2000s, a dancer with Queensland Ballet, and his dance journey since then has been a complicated one. He certainly moves like no-one else.